Members of a residential action group of the beleaguered town of Okahandja laid a criminal charge against an employee of the Constituency Council who threatened them with a knife when they entered the office to speak to Steve Biko Booys. Besides accusing the embattled Constituency Councillor of biased conduct the group indicated that his criminal behaviour will escalate into real physical violence amongst residents. The case of assault by threat was perpetrated against three members of the concern group who earlier called for the immediate removal of Booys from the position of Constituency Councillor. 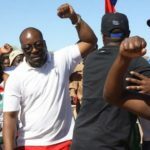 During a mass meeting held recently the group repeated their call on the Namibian President to intervene and to remove Booys from his position. One f the leaders laid the criminal charge against the councillor and another person, employed at the constituency office as a receptionist, after she threatened and chased them out of the building with a knife last week. The matter was before court last Wednesday and was postponed until the last week of February. During December the residents organised a protest march to hand in a petition at the constituency office in which they expressed their deepest disappointment and shock at the actions of Booys who for the past eight years have often been at the centre of political controversy in the Otjozondjupa Region. The petition was also forwarded to the Office of the President because none of the constituency councillors was willing to accept the petition. In their petition the unhappy residents claimed that the constituency councillor facilitated the creation of two distinct residential concern groups to support him, but when in public, only sides with one group called the Okahandja Concerned Group. In their petition the residents claim that Booys has also created an ever widening gap between the rich and the poor residents of the town. The group held a mass meeting recently during which they took stock of the progress made with their petition and found that none of their concerns have been addressed by the controversial constituency councillor. They also resolved to afford the Office of the President more time to consider their grievances and to remain steadfast in their resolve to take any possible action that might result from their cause. People attending the recent mass meeting reported that members of the Okahandja Concerned Group threatened to harm people from the other group if they should visit the constituency office by pouring boiling water on them of stabbing them with knives. The protest action stems from Booys not responding to queries following a meeting held on the 9th of November 2018 at the Nau-Aib Stadium during which they demanded that he provide them with a progress report of his work since he took office eight years ago with regard to capital projects initiated and implemented by his office in the Five Rand Camp informal settlement, Veddersdal, the Oshetu 1, 2 and 3 locations as well as the Nau-Aib neighbourhood. The concern group called on the president to intervene and to remove Steve Biko Booys from the Constituency Council. 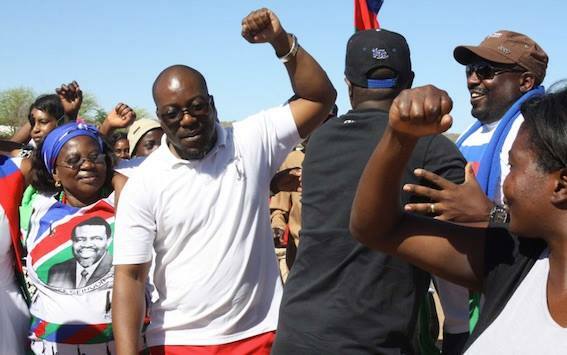 The group also demanded that the ruling party, SWAPO, investigate his conduct and that be fired from the National Council.